Opposition leader from Assam Debabrata Saikia on Saturday launched scathing attack on BJP for ‘failing’ to deliver to its promise and spreading lies that Congress has done nothing through massive advertisement in social media. “During 2014 Lok Sabha election, Narendra Modi promised 2 cr jobs in the country but due to imposition of GST and demonetization 1 cr people have lost their jobs. GST has posed burden on many industries and companies who had to close their business”, Saikia said at an election rally at Betasing under Ampati constituency, where Meghalaya chief minister Mukul Sangma is pitted against BJP candidate Bakul Hajong. Saikia spoke at the rally in Assamese as 40 per cent people in the constituency belong to Koch and Hajong community. Attacking BJP for propagating lies against Congress, the Assam MLA said, “They are blaming Congress for lack of development. Let me remind them that during 60 years of Congress rule, India has developed to a great extent. The contribution of Congress from Independence to India’s growth and success is unimaginable. We have made advances in all sectors; we have made India super power and have made advances in scientific research, while BJP is spending crores to build huge statues”. Saikia accused Modi of renaming 28 ambitious programmes taken up during Congress government at the centre. “They are good only in renaming and creating advertisement spending public money. Congress party believes in uplifting socio-economic condition of the people and not marketing”, he added. He cautioned the electorates against BJP, who are all out to tarnish the image of Congress party. “Under the leadership of chief minister Mukul Sangma Meghalaya has marched ahead in different spheres of development”, he said while highlighting that in Meghalaya 222 villages were connected withpuccaroad under PMGSY and 1000 villages were completely electrified in the last five years. Saikia said that even Modi government has praised Meghalaya by awarding award for best agriculture practices for three consecutive terms. “Farmers of Meghalaya are hardworking and with the cooperation of the farmers, Meghalaya has set a trend in the development of agriculture sector”, he added. Terming BJP as a threat to the cultural integrity of the country, he said, “BJP wants to create own rules to govern the nation. We should never allow this to happen”. 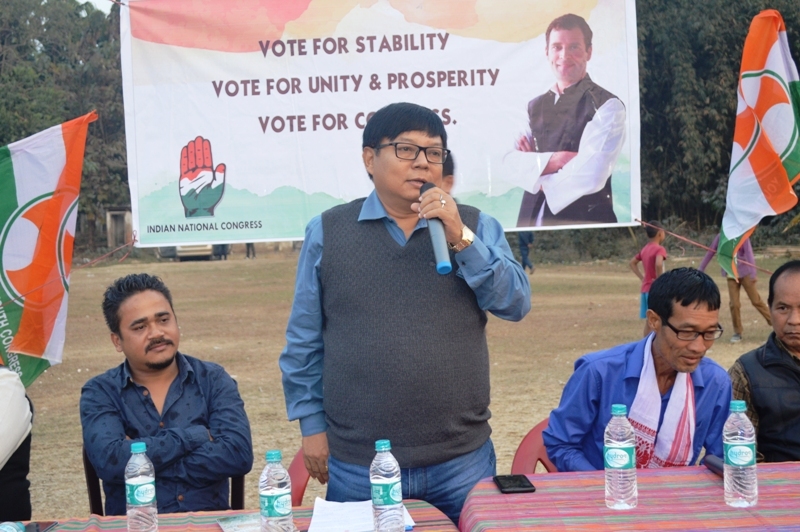 He urged the people not to be misguided and repose their faith in Congress party and ensure the victory of Mukul Sangma for the sixth terms from Ampati constituency.